The relatively small size of this altarpiece indicates that it was made for a domestic chapel or an altar in a church. 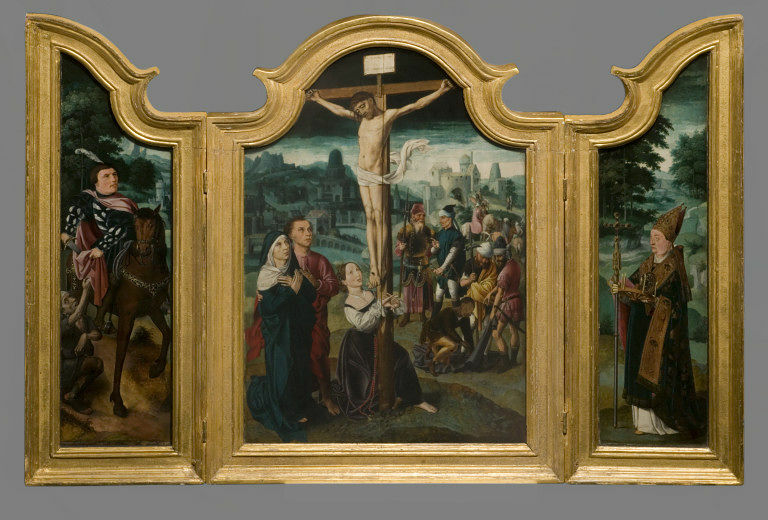 The landscape background on the interior panels suggests a Netherlandish origin for the painting. The Annunciate Virgin and Archangel Gabriel in grisaille on the reverse of the wings also supports this and suggest a date of c.1500. Saint Mary Magdalene, accorded prominence with her rosary at the foot of the cross, appears with the Virgin Mary and St John the Evangelist in the central panel. Together with Saints Donatian, whose presence is evidence of a Bruges origin for the triptych, and Martin of Tours in the lateral panels, the foreground figures would have provided mediation and models of devotion for the beholder. They are united by their contemplation of the dying Christ - in contrast to the indifference of the soldiers in the middle ground - and the panoramic landscape that extends across all three parts of the triptych. Oil on oak panel depicting the Crucifixion with Mary Magdalen at the foot of the cross, St. Donatian and St. Martin. Triptych, the reverse of the wings painted with grisaille figures of the Virgin and the Archangel Gabriel. 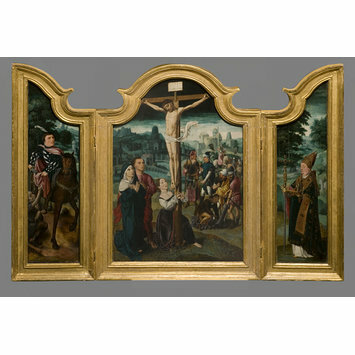 According to Didier Martens, the central panel of this tryptich was probably executed in Bruges due to the presence of saint Donatian, whose cult did not spread much further the city. The fragmentary Annunciation on the reverse of the two side wings was probably painted earlier around 1500. The central panel takes inspiration from Gerard David's Crucifixion (now in Berlin), commissioned in 1501 while the figure of saint Martin echoes a similar figure on the left side wing of a tryptich in the church of Torrecilla en Cameros (Rioja, Spain), commissioned in the 1550s by Martin Gonzales de Andia, who was an important member of Charles V's court, to a Bruges painter of the Claeissens familly, probably Peter the elder. Both painters were probably looking at the same (lost) prototype. The figure of saint Donatian, on the right side wing, clearly refers to the same saint represented in The Virgin and Child with Canon van der Paele, executed by Jan van Eyck in 1436. This direct quotation suggests that the author of the present painting saw van Eyck's painting in situ. Didier Martens, "Une image et sa descendance: échos méconnus de la Madone au chanoine Van der Paele de Jan van Eyck", Revue de l'art, no. 197/2017-3, pp. 29-41, fig. 9 and 12.